While 2010’s Red didn’t dominate the box office, it eked out enough business to prompt a sequel. Thus we get 2013’s Red 2, a more expensive – and less successful – effort that appears to have ended the franchise. In the first flick, retired CIA Agent Frank Moses (Bruce Willis) came out of retirement to protect a civilian named Sarah Ross (Mary-Elizabeth Parker). As Red 2 opens, we find those two amidst life as a couple. Frank needs to go back into action when he hears from his former colleague Marvin Boggs (John Malkovich). Frank learns that a portable nuclear device called “Nightshade” may end up in the wrong hands, so along with the assistance of others, Frank and pals try to guarantee its security. 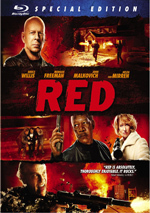 As one who really enjoyed the first Red, I looked forward to Red 2. It brought back most of the original film’s stars and added Anthony Hopkins and Catherine Zeta-Jones – what could go wrong? While nothing goes horribly awry with Red 2, the movie simply lacks the same loose charm and energy of its predecessor. It throws plenty of action and intrigue at us, but these components don’t boast a great deal of vivacity. That means Red 2 tends to feel like “empty calories”. Whereas its predecessor managed a little meaning among the mayhem, the sequel seems more like action for action’s sake. Not that it doesn’t stab at a theme of sorts, mainly via the Frank/Sarah connection. In a modest manner, Red 2 attempts to use its story as an exploration of relationship issues. And I do mean modest. This concept crops up when the filmmakers need it, but the topic doesn’t present a lot of depth. Red 2 does rely on Sarah much more than the first film did, and that becomes its biggest flaw. In Red, Sarah acted as the audience proxy – she gave us a “regular person” view of all the insanity and helped keep the movie grounded. In the sequel, however, Sarah turns into a massive liability, mainly because the film makes her childish and immature. Half the time Sarah acts like a moron, and the other half she behaves like a vindictive witch. Neither characterization suits her, and Sarah ends up as a whiny nuisance. Parker offered charm and verve to Reds, but in the sequel, she annoys. The other actors fare better, but none of them seem as much fun as they did in the prior flick. While I won’t claim they’re punching the clock here, they simply don’t show the same sense of involvement this time. None of these factors make Red 2 an actual bad film, as it musters enough action and excitement to keep us with it across its 116 minutes. The movie packs in a nice collection of violent sequences – especially when we see Byong-hun Lee as Frank’s primary nemesis. These scenes give us some entertainment, but they’re not enough to fully redeem Red 2. It lacks the spark found in the first movie, so it winds up as a fairly mediocre adventure. Red 2 appears in an aspect ratio of approximately 2.40:1 on this Blu-ray Disc. Though the first film came with a lackluster visual presentation, the sequel looked great. This meant consistently sold definition. Virtually no softness cropped up here, so we got a tight, concise image. Moiré effects and jaggies failed to manifest, and I saw no signs of edge haloes or print flaws. Like most action flicks, Red 2 went heavy on teal and amber. Within those choices, the colors appeared well-rendered. Blacks seemed dark and dense, while shadows were smooth and clear. This turned into a wholly satisfying image. In addition, the film’s DTS-HD MA 5.1 soundtrack boasted high-powered thrills. With plenty of violent action on display, the soundfield enjoyed many opportunities to shine, and it took good advantage of these. In particular, car chases added a lot of fun movement and activity, as those scenes filled the channels in a vivid manner. Gunfire and explosions added to the mayhem, and all of this combined for a winning soundscape. Audio quality matched up well, with natural, concise speech. Music sounded full and rich, while effects appeared accurate and dynamic, with deep low-end to boot. The audio helped add zing to the proceedings. A few extras fill out the set, and a four-part documentary called The Red 2 Experience launches matters. It lasts a total of 34 minutes, 41 seconds and offers comments from director Dean Parisot, producer Lorenzo di Bonaventura, screenwriters Eric and Jon Hoeber, stunt coordinator/2nd unit director Paul Jennings, and actors Bruce Willis, Helen Mirren, John Malkovich, Mary-Louise Parker, Anthony Hopkins, Catherine Zeta-Jones and Byung-hun Lee. The program looks at cast/characters/performances, story areas, weapons, vehicles, stunts and action, influences, and Parisot’s influence on the production. “Experience” offers a decent look at the film but it lacks much depth. It tends toward the fluffy side of the street, so don’t expect a ton of insights here. Five Deleted Scenes take up a total of four minutes, 27 seconds. Two of them actually offer alternate versions of the same sequence, one in which Victoria finds a way through security. Another shows the death of a military character and how Han came into the proceedings – along with the Victoria scene(s), that’s the best of the bunch. The others give us basic “shoe leather” and lack much of interest. Still, two and a half good cut sequences is better than average – most deleted scenes are snoozers, so I’m happy some of these have merit. A Gag Reel goes for four minutes, 24 seconds. It offers a standard array of goofs and laughs, though it comes with more profanity than most. The disc opens with ads for Ender’s Game and Expendables 2. No trailer for Red 2 appears here.